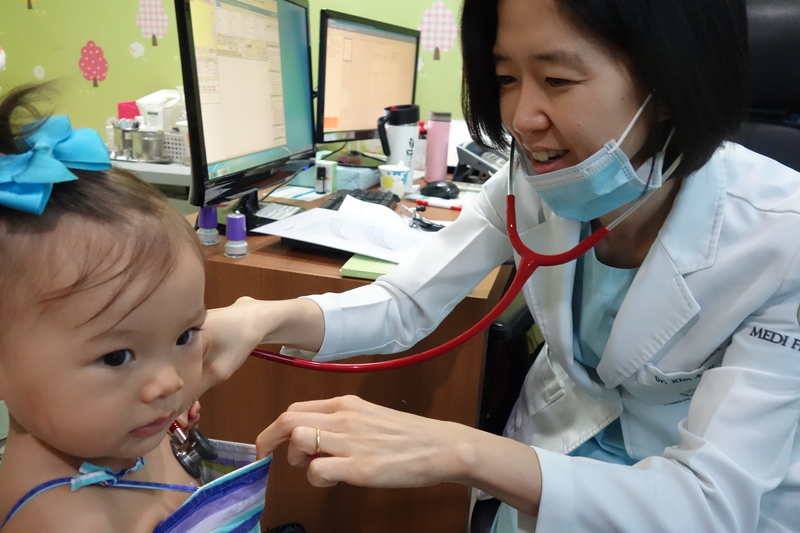 Isa returned to the actual place of her birth, Mediflower Clinic in Seoul, for her one-year check up and shots. She is clockin’ in with good stats within normal ranges (unlike her sister who busts the growth charts for no explainable reason). Isa’s 21 pounds, 30 inches and has seven teeth. She’s not walking yet but she’s cruisin’ a lot. Her favorite food are bananas and tamago (egg) sashimi. She loves to flip through pages of books and pretend she’s reading, laugh hysterically and in one of the funnier Isa activities, when she gets pat on the back to be burped, she simultaneously pats mom or dad on the back at the same time, trying to burp us, too. In my next post I’ll do an update on her travel stats at age one.